College Park, MD – Prince George’s County Executive Rushern L. Baker, III was joined by Lt. Governor Anthony Brown, County Council Vice Chair Eric Olson , Council Members Mel Franklin, Andrea Harrison, Mary Lehman, and Karen Toles, and Prince George’s Fire/EMS Department Acting Chief Marc Bashoor at the International Association of Firefighters (IAFF) Local 1619 inaugural “Fire Ops 101.” Conducted at the University of Maryland Fire Rescue Institute, participants conducted hands-on drills and watched scenarios to better understand the physical and mental challenges of being a fire fighter and paramedic. This was the first year that IAFF Local 1619 has conducted “Fire Ops 101.” Joined by members of the media and staff from the County Executive Office, County Council and federal delegation, participants engaged in drills consisting of putting out a fire with a hose, an indoor live burn exercise where participants breathed through oxygen tanks in room that reached in excess of 500 degrees, as well as a training maze. 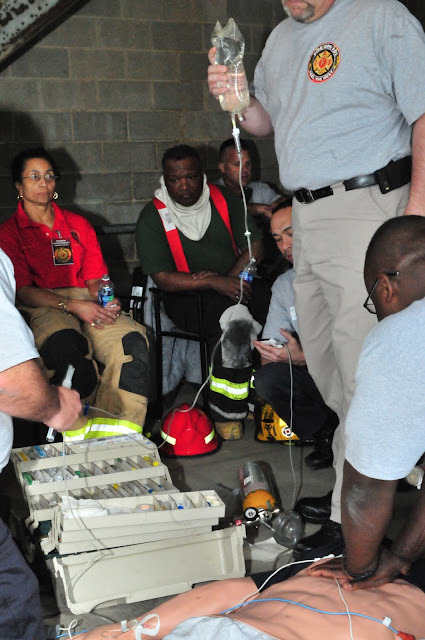 Additionally members of the Prince George’s County Professional Firefighters and Paramedics Association (IAFF 1619) conducted EMS and fire response scenarios. Prince George’s County Executive Rushern L. Baker, III proudly saluted public safety recipients from the County’s Police, Fire/EMS, Corrections, Public Safety Communications and Office of the Sheriff during the 2011 Valor Awards held at Martin Crosswinds in Greenbelt, Maryland, on Wednesday, April 27, 2011. Now in its 34th year, the Valor Awards are an opportunity for the County Executive to honor the men and women in public service who do so much to protect the lives of Prince George’s County residents. Kerry Watson, Senior Advisor for Public Safety to the County Executive served as the Master of Ceremony. Wisdom Martin and Paul Wagner, both FOX5 (WTTG) reporters narrated the inspiring stories of the award recipients. Fire Chief Marc S. Bashoor selected Al Schwartz as the 2010 Firefighter of the year and Firefighter/Medic Chris Blackistone as the 2010 Paramedic of the year. On July 4, 2010, Fire Fighter/Medic Antonio Cole and Fire Fighter Melvin Batts attended a family gathering in Waldorf, Maryland. While swimming in a backyard pool, a 13-year-old male ingested a large amount of water and lost consciousness, sinking to the bottom of the pool. It is not known how long he was underwater before two bystanders noticed his distress and dove in to effect rescue. Family members described the unconscious teen’s condition as lifeless, without a pulse or respiration's and a bluish skin tone in his extremities. Cole and Batts immediately went to the teen’s aid and after a rapid patient assessment, initiated CPR. Bystanders estimated that CPR had been performed for several minutes before the teen began to cough and display signs of life. The two veteran medics loaded the teen into their own vehicle and drove him to the nearest hospital. The teen’s condition and vital signs were closely monitored while en route to the hospital. Emergency Room staff commented that if it had not been for the skills of the EMS providers, the outcome could have been tragic. After stabilizing, the patient was transferred to Children’s Hospital in Washington, DC, where he spent two days in the Intensive Care Unit before being released. For quick thinking, unusual personal risk, and judgment, Retired Fire Fighter Melvin P. Batts and Fire Fighter/Medic Antonio D. Cole are hereby awarded a Bronze Medal of Valor. On Saturday, September 11, 2010, Captain James Jiron was attending a family celebration in Woodstock, Virginia. While outdoors, he noticed smoke coming from the rear of an apartment building across the street. After instructing family members to call 9-1-1, Captain Jiron and his father-in-law proceeded to the building to alert the occupants of a fire in their duplex. Upon entering the residence, Captain Jiron discovered one man asleep on a couch on the first floor. A second man was upstairs. He warned them of the fire and both escaped unharmed. In an attempt to slow the spread of the fire, Captain Jiron placed a table against a doorway as his father-in-law used a fire extinguisher in an attempt to control the flames. For quick thinking, unusual personal risk, and judgment, Fire Fighter/Medic Captain James M. Jiron is hereby awarded a Bronze Medal of Valor. This is Captain Jiron’s second Medal of Valor, having received a Bronze Medal in 2008. On April 13, 2010, Volunteer Fire Fighter Justin Eric Davidson was off duty and visiting the home of his parents. Asleep at the time, Davidson was awakened by the sound of his mother screaming that the house was on fire. Recognizing that fire and heavy smoke were pushing from the attic eaves into the living room, Davidson evacuated his mother and two family dogs from the house, instructing her to call 9-1-1. Davidson obtained a shovel and a fire extinguisher and then re-entered the house to locate his father. Operating without personal protective gear or a charged hose line, Davidson was able to locate his father, who is disabled and suffers from severe emphysema. Davidson then positioned himself between his father and the fire, and evacuated him to safety. He then re-entered the structure and continued his attempts to keep the fire in check until the arrival of the fire department. For quick thinking, unusual personal risk, and judgment, Volunteer Fire Fighter Justin Eric Davidson is hereby awarded a BRONZE Medal of Valor. MAJOR H. “BUTCH” LEONHARD, JR.
On the afternoon of Thursday, July 22, 2010, a citizen called 9-1-1 stating that a 12-year-old male was motionless in a neighbor’s pool in the Marlton community of Upper Marlboro. The caller advised dispatchers that her uncle was in the process of gaining access to the pool area. Monitoring the call, Battalion Chief Leonhard responded to the scene and was the first arriving Fire/EMS unit, followed by Captain Valencis, who also responded from the nearby Fire/EMS Training Academy. Upon reaching the scene, Battalion Chief Leonhard observed two victims in the deep end of the swimming pool and radioed for additional resources. Realizing this was a life or death situation, Captain Valencis and Battalion Chief Leonhard immediately entered the water. Shortly thereafter, they were joined by Fire Technician Bullock, who had arrived onboard the engine from the Croom Fire/EMS Station. The trio entered the 8-foot-deep end of the pool and lifted two male victims to the surface, handing them to awaiting personnel. Paramedics rapidly assessed the victims, determining them to be unconscious, without respiration or a detectable pulse. The patients were loaded into separate transport units and taken to nearby Southern Maryland Hospital where emergency room staff worked feverishly to revive them. Investigators believe that prior to the arrival of the Fire/EMS Department, the 59-year-old uncle of the younger male victim witnessed his nephew lying on the bottom of the pool and attempted to save him. Sadly, though the actions of the rescuers provided the best chance for survival, both victims succumbed. For their actions in a hazardous situation and placing themselves in unusual personal risk, Major Butch Leonhard, Battalion Chief Grady A. Valencis, and Fire Fighter/Technician Darryl H. Bullock are hereby awarded Bronze Medals of Valor. This is Battalion Chief Grady Valencis’ third Medal of Valor, having received Bronze Medals in 2000 and 2009. On Monday, April 26, 2010, immediately after having been presented Medals of Valor at the 2009 Valor Awards, firefighters from Kentland Fire/EMS Station 833 were dispatched to an apartment fire at 6510 West Forest Road. Approaching the area, crews observed a column of smoke. Public Safety Communications reported people trapped on the second and third floors. Units arrived to find thick smoke coming from the rear of a three-story brick apartment building. Bystanders informed them of occupants trapped in the front and back of the building. Crews immediately began to effect rescues. The Tower driver began running ladders to the rear while Volunteer Chief Kelleher, along with other crew members, laddered the front. Crews advanced hose lines to the second floor, encountering high heat and zero visibility. Entering the apartment of origin, the Tower crew aggressively searched while the Engine crew attempted to control the fire. Chief Kelleher was feeding hose line to the team when he heard a frantic mother yelling to inform him her child was trapped on the second floor. Suddenly hearing a choking sound coming from the second floor landing, Chief Kelleher entered the building. He quickly located a young child and passed him to the next arriving interior firefighters. Finding no additional victims in the apartment of origin, crews continued their search to the third floor where the Tower crew conducted a primary search. Volunteer Captain Brown located an occupant locked in the bathroom of a smoke-filled apartment with her head pressed into a small window opening for air. She was still on the phone with 911 call takers. Captain Brown directed her to stay put and proceeded to the adjacent room to clear a window for evacuation. Chief Kelleher placed a ladder at the window and guided the woman to safety. At the same time, a similar situation was occurring in another third floor apartment, with another crew member placing and scaling a ground ladder to remove an adult male from his smoke-filled apartment. For their courageous actions while exposed to great danger, Volunteer Captain Walter “Joe” Brown is awarded the Silver Medal of Valor and Volunteer Chief Anthony P. Kelleher is awarded the Bronze Medal of Valor. This is Joe Brown’s third Medal of Valor, having received the Gold and a Silver Medals in 2009 and 2005, respectively. This is also Tony Kelleher’s third Medal of Valor, having received a Silver in 1998 and a Bronze in 2009. On the evening of Friday, November 5, 2010, Fire/EMS Department personnel were alerted to a residential fire in the 6400 block of Princess Garden Parkway in Lanham. While en-route, dispatchers informed responding units of the possibility of an elderly male trapped inside the burning residence. On arrival, crews worked quickly to extinguish the blaze and search for the reported victim. Under conditions of blinding smoke and intense heat, Fire Fighter/Medic William Vanarsdale commenced an aggressive search. Locating the man in a bedroom, he and Volunteer Fire Fighter Kyle Schultz quickly evacuated him to safety. The victim was transported by paramedics to the Burn Unit at the Washington Hospital Center where he was treated for burns and smoke inhalation. The victim made a full recovery from his injuries. For great personal risk, judgment, and skills, Fire Fighter/Medic William Vanarsdale and Volunteer Fire Fighter Kyle Schultz are hereby awarded Silver Medals of Valor. On the morning of Tuesday, February 2, 2010, Prince George’s County public safety agencies responded to the intersection of New Hampshire Avenue and Piney Branch Road in Adelphi for a report of a male standing in the middle of a section of the Northwest Branch. Upon arrival, firefighters observed an adult male beneath the New Hampshire Avenue Bridge standing motionless in several feet of frigid water. Ignoring commands in both English and Spanish, the individual remained unresponsive. A request was made for the Fire/EMS Department Technical Rescue Team (TRT) to assist with removing the victim from the water. Due to the victim’s unpredictable mental status and the potential that the victim could be armed, Fire Captain Stephen J. Gallagher and Fire Fighter/Medic Bino Harris from TRT developed a plan of action for police officers to accompany them into the water. For the safety and welfare of everyone involved, two police officers donned cold weather gear and dry suits and entered the water with Captain Gallagher and Fire Fighter/Medic Harris. At approximately 9:30 a.m., the combined rescue team of firefighters and police officers removed the male from the water and handed him over to the care of EMS personnel. The patient was transported to a local hospital where he received treatment for hypothermia and was further evaluated. For their actions in this potentially dangerous situation and placing themselves at great personal risk, Fire Captain Stephen J. Gallagher and Fire Fighter/Medic Bino Harris are hereby awarded Silver Medals of Valor. VOLUNTEER FIRE FIGHTER STEPHEN L. WHITMAN, JR.
On Friday, February 26, 2010, units were dispatched to a reported apartment fire at 3212 Toledo Place in Hyattsville. Crews arrived to find thick smoke and fire coming from inside an apartment occupied by two residents. Upon entering the unit of origin, crews encountered an unconscious adult male with severe burns on the majority of his body. Volunteer Fire Fighters Whitman and Zupancic quickly removed the victim and handed him over to the care of EMS personnel. Meanwhile, other crew members worked to extinguish the fire. Fire Lieutenant Flanagan initiated a search ahead of the hose line in an effort to rescue the reportedly trapped four-year-old. Locating the young victim, Lieutenant Flanagan carried her outside to Technician Blackistone. As a veteran paramedic, Technician Blackistone assessed the patient and commenced rescue breathing. Once spontaneous respiration was restored, the girl was transferred to the care of EMS personnel. After a brief stay in the hospital, she was released and has recovered fully. The adult male tragically succumbed to his injuries. For extreme personal risk and the highest degree of judgment, Fire Fighter/Medic Lieutenant George E. Flanagan, III is hereby awarded the Gold Medal of Valor. For great personal risk, judgment, and skills, Volunteer Fire Fighter Nic Zupanicic and Volunteer Fire Fighter Stephen L. Whitman, Jr. are hereby awarded Silver Medals of Valor. For his skills, ingenuity, and zeal, Fire Fighter/Medic Christopher B. Blackistone is awarded the Bronze Medal of Valor. Furthermore, let it be known that because of his unparalleled skills used to save the lives of others, Fire Chief Marc S. Bashoor takes great pride in naming Fire Fighter/Medic Christopher B. Blackistone as the 2010 Prince George’s County Fire/EMS Department’s Paramedic of the Year. This is Fire Fighter/ Medic Blackistone’s second Medal of Valor and second occasion for being designated Paramedic of the Year, having received a Silver Medal and the top distinction in 2008. On Sunday, July 25, 2010, powerful thunderstorms rolled through Prince George’s County producing strong winds of up to 90 miles-per-hour. Dozens of trees and numerous power lines came down as a result of the storm. Several days passed before the area fully recovered. On an incident in the 10100 block of Rhode Island Avenue in College Park, a tree fell on a car occupied by two adult females, extensively damaging the vehicle and crushing the passenger compartment. Arriving on-scene, Volunteer Fire Chief Al Schwartz determined the driver of the vehicle had tragically succumbed to her injuries and the passenger, suffering a large laceration to her head, was conscious and alert, but pinned inside the vehicle. Throughout the duration of the rescue, Volunteer Fire Fighter Schwartz maintained verbal and physical contact with the passenger, learning she was the mother-in-law of the deceased victim. For his bravery, compassion, and highest degree of professionalism while facing unusual personal risk, Volunteer Chief Alfred C. Schwartz is hereby awarded a Bronze Medal of Valor. Furthermore, let it be known that because of his unparalleled courage, skills, and compassion use in an extremely difficult and challenging incident, Fire Chief Marc S. Bashoor takes great pride in naming Volunteer Fire Chief Alfred “Al” Schwartz Prince George’s County Fire/EMS Department’s 2010 Fire Fighter of the Year. On February 27, 2010, at 6:55 a.m., Corporal Thomas Jensen was on patrol when he received a call to respond to an apartment complex in the 5200 block of Kenilworth Avenue for the report of a man who was acting irrational and violent. According to the 9-1-1 caller, the suspect appeared to be under the influence of a controlled dangerous substance and had just thrown a concrete cinder block through the window of an apartment, where he gained entry and was alone with a woman who had no connection to him. As officers responded, dispatchers were receiving additional information from witnesses. The witnesses reported the suspect ran from the woman’s apartment and was now in the hallway fighting Fire/EMS personnel, who were there because of the man’s erratic behavior. Due to the mounting violence and realizing the imminent danger the suspect posed to firefighters, EMS and citizens, Corporal Jensen responded priority. While in route, Corporal Jensen’s cruiser struck a patch of ice, on Baltimore Avenue in College Park, causing him to lose control and crash into a utility pole. He was transported to Prince George’s Hospital Center, where he was admitted in critical condition. For the next ten days, Corporal Jensen was surrounded by family and friends who encouraged him to fight for his life, but sadly, Cpl. Jensen succumbed to his injuries on March 9. Corporal Jensen made the ultimate sacrifice and gave his life to protect citizens and emergency workers of Prince George’s County. For his heroic and selfless actions while responding to this life-threatening incident, Corporal Jensen is awarded the Gold Medal of Valor. And, let it be known that because of his unparalleled courage and unhesitating willingness to put his life on the line to protect the lives of others, Police Chief Mark Magaw takes great pride in naming Corporal Jensen Prince George’s County Police Officer of the Year for 2010. Accepting this posthumous award is Ms. Kristelle Jensen, widow of Thomas P. Jensen. 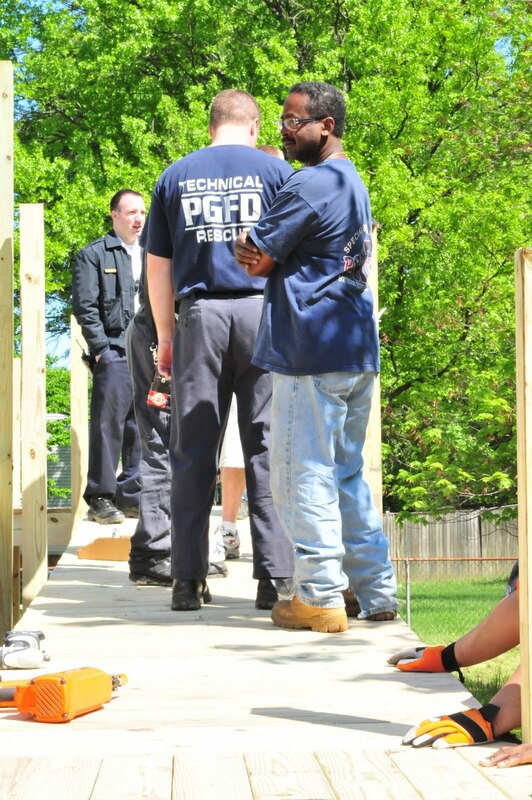 On Saturday, April 30, Prince George’s County Fire Chief Marc S. Bashoor joined Department members and community volunteers in the 23rd Annual Christmas in April, a Prince George’s County program to renovate homes for elderly and disabled homeowners. Homes across the County were repaired, manicured and provided some TLC and the Fire/EMS Department is just one agency of many that worked on homes. 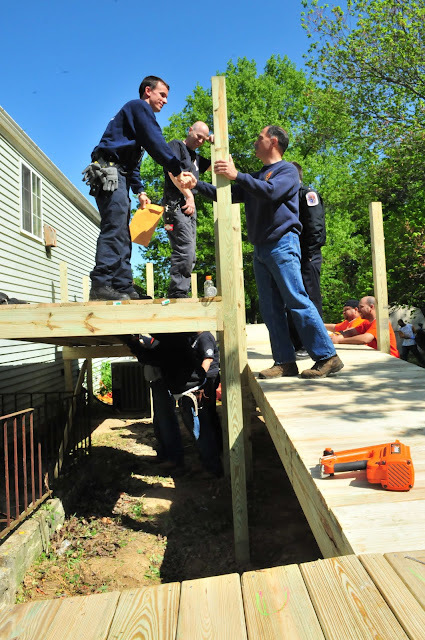 Dozens of career and volunteer men and women of the Fire/EMS Department participated and worked at four houses and provided a variety of tasks including yard maintenance, painting, electrical work, general cleaning and at one home; built a ramp for easy egress and access. 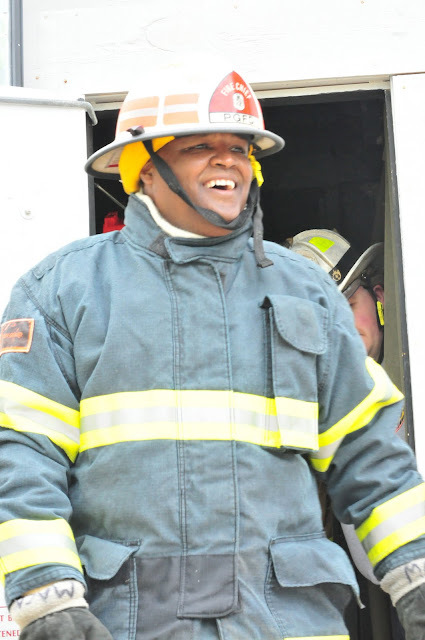 James Jiron, a Firefighter/Medic Captain assigned to the College Park Fire/EMS Station #812, was the house captain at 7937 Fiske Avenue in Glenarden. Painting, new ceiling fans and general yard work were the major items at this house. Over a dozen community volunteers assisted Jiron. Barry Quade, a Firefighter/Medic from the Fort Washington Fire/EMS Station and crew may have planned and executed the most ambitious Christmas in April project. 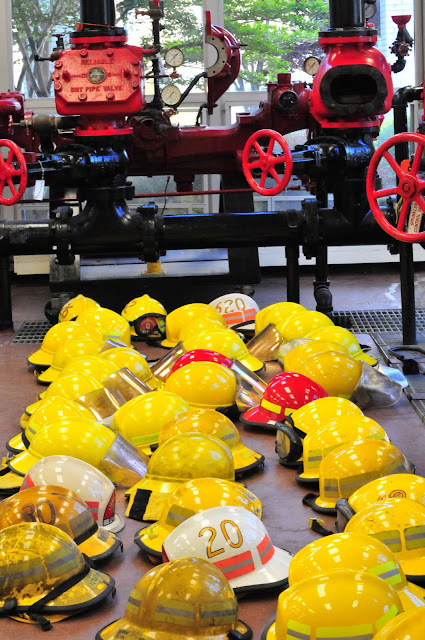 This project was formed from first hand experience of firefighter/medics. Firefighter/Medics from the Fort Washington Station have been requested to assist a mobility challenged individual that resides in the 12200 block of Parkton Street over 100 times since September 2010. They assist the occupant in exiting from her home to a vehicle followed by a return trip later in the day to assist her back into the house. With hazardous walking conditions and other factors involved in moving the occupant, firefighter/medic injuries have occurred and the possibility of additional injuries occurring are high. Quade served as the project house captain and has been working since February with Leon Ram and Ian Stewart, Manager and Assistant Manager of the Oxon Hill Home Depot in negotiating the donation of materials to construct a ramp that will assist the homeowner and firefighter/medics when they are needed to assist in moving the occupant. In addition to the Oxon Hill Home Depot, stores in College Park, Silver Spring, Brentwood (DC) and Hyattsville worked together to provide well over $3,000 in materials used in the construction of the ramp. A community volunteer unloads mulch at 7937 Fiske Avenue in Glenarden. James Jiron, a Firefighter/Medic Captain assigned to the College Park Fire/EMS Station #812, was the house captain at 7937 Fiske Avenue in Glenarden. Painting, new ceiling fans and general yard work were the major items at this house. Fire Chief Marc Bashoor cuts and Capitol Heights Volunteer Chief Jim McClelland removes the trimmings 7701 Orange Tree Court in Capitol Heights. Homeowner Sandra Y. Folsom and Capitol Heights Volunteer member and house captain Weaver (background) observe work in the backyard. Bashoor and McClelland are still working to remove the overgrowth on Orange Tree Ct.
Capitol Heights and community volunteers work on the front yard of home on Orange Tree Court. Third Battalion Firefighters paint the front steps on Kenova Street in District Heights. Third Battalion Firefighters seal and paint the rear door on Kenova Street in District Heights. Third Battalion Firefighters paint the interior on Kenova Street in District Heights. Fire Chief Bashoor greets Paula Quander and her mother Bethel Quander, residents of the house on Kenova Street in District Heights. Ramp construction at a house on Parkton Street in Fort Washington. Fire Chief Bashoor, Firefighter/Medic and house captain Barry Quade and Oxon Hill Home Depot General Manager Leon Ram. The Christmas in April group on Parkton Street in Fort Washington. 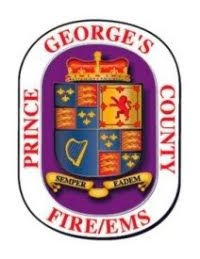 Prince George's County Firefighter/Medics from the Temple Hills area were alerted at 12:20 pm today, Saturday, April 30, 2011, of a pedestrian vs car crash. Fire/EMS units responded and found three male victims near or at a car wash at Branch Avenue and Curtis Drive. The patients sustained an array of injuries and have been transported to a Trauma Center. One patient has sustained life threatening injuries and the other two sustaining less serious, non-life threatening injuries. The County Police Department are investigating the incident and should be contacted for any updates. On the evening of April 27, 2011, a young woman was dropping off an individual at the Landover Hills Fire/EMS Station 830. The person being dropped off is a Firefighter/Medic candidate and was going into the station’s gym to participate in the conditioning program to prepare for the Candidate Physical Ability Test (CPAT). Suddenly, CPAT candidates ran into the station and alerted crews that a woman at the rear of the building was having a seizure. Immediately and without hesitation the ambulance and engine pulled around to the rear parking lot. On arrival, crews encountered CPR being administered to the 23-year-old woman by Lieutenant Colonel Jerry LaMoria and CPAT Instructors. The patient was quickly placed on a backboard and moved into a transport unit. The patient’s heart rate/rhythm was in V-fib and crew members defibrillated the patient, followed by two minutes of CPR. An IV was established, medications were given, and the patient was defibrillated from V-fib a second time to a viable heat rhythm with a pulse and good blood pressure. The young woman was transported to the hospital via Ambulance 830, with two medics onboard. When crews departed the hospital, the patient was doing well and expected to make a full recovery. On the morning of January 28, 2011, the Paramedic Engine and Medic units from Chillum-Adelphi Fire/EMS Station 844, along with the Engine and Ambulance from Adelphi Fire/EMS Station 834, were dispatched to New Hampshire and University Boulevard for a reported shooting. While en route, Public Safety Communications (PSC) advised there were three gunshot victims, including a police officer. PSC further advised that police had cleared the scene, and it was safe for responding crews to enter. However, upon arrival, units from Fire/EMS Station 834 observed the scene and deemed it unsafe. Shortly thereafter, units from Fire/EMS Station 844 arrived but were stopped by police officers, who removed the stretcher from one of the units and proceeded to the incident scene. Crews were informed there were three confirmed injured, including a police officer who suffered a gunshot wound to the leg. No additional injuries were reported at that time. At 0945 hours, Fire Fighter/Medic Lieutenant James E. McClelland, Jr., established the New Hampshire Avenue command. A gunshot victim was found unconscious and lying handcuffed on the stretcher, and police officers loaded the injured male into the rear of Medic 844. Subsequently, Fire Fighter Maynard and Fire Fighter/Medic Technician Peters boarded the unit to assist Fire Fighter Granados and Fire Fighter/Medic Wood, who were assessing the unconscious patient. Two street-clothed police officers, also onboard Medic 844, suddenly jumped from the unit and began running and yelling, “The suspect has a device on him!” McClelland immediately ordered all crews to evacuate their units, whereupon they relocated away from the scene of the incident. He advised another police officer that his colleague had warned that the suspect was possibly armed with a device. Firefighters guided civilians and media personnel away from the hot zone to safety and contacted PSC to provide an update. You requested to have the bomb squad dispatched and the command staff notified. Montgomery County Fire and Rescue Engine 716, unaware that our units were on the scene and had already established command, arrived and established command. You notified PSC that Montgomery County’s Battalion 701 was on the scene and assuming the New Hampshire Avenue Command, as the incident was in their jurisdiction. The crews from Adelphi Fire/EMS Station 844 triaged and treated the injured victims, and the wounded police officer was transported by Montgomery County ambulance. The ambulance crew from Fire/EMS Station 834 triaged and treated a patient with a head injury, possibly a gunshot wound to the head. Fire Fighter/Medic Technician Peters was the ALS provider onboard the unit, which transported the patient to the Trauma Center at Prince George’s Hospital Center. The remaining crew members, Fire Fighter Curtis L. Chase, Fire Fighter/Medic Technician Jennifer M. Lawhorne and Fire Fighter Anthony Wallach, were utilized to establish a triage of any future patients and were later used as suppression support for bomb squad units operating n the scene. The medic unit was cleared and deemed safe by bomb squad personnel. Units were cleared and returned to service after operating for nearly three hours. Despite the various obstacles encountered, your performance on the scene of this incident was nothing short of professional. You remained calm while operating in life-threatening and hostile conditions. Additionally, all injured victims were removed to safety and triaged, treated, and transported. For the outstanding manner in which you performed your duties on the scene of this incident, you are hereby presented a Fire/EMS Department Emergency Service Award. Congratulations, and thank you for a job well done. Your actions represent the excellent service our Department provides to the citizens of Prince George’s County. 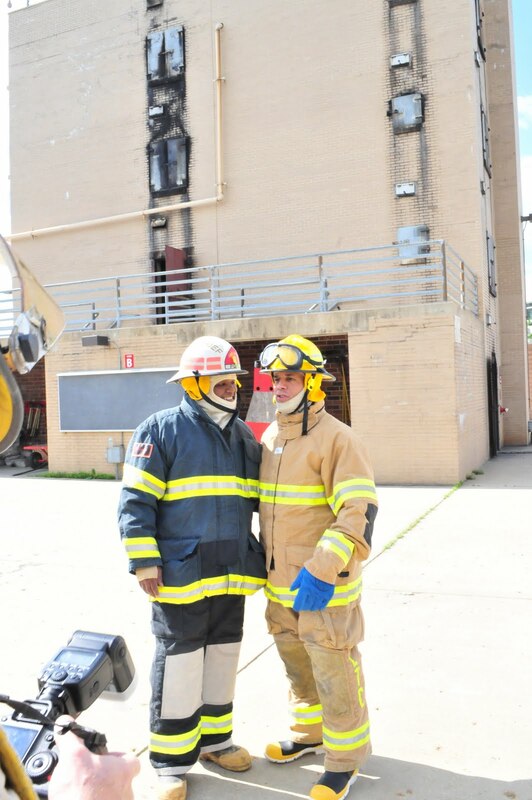 Fire Chief Marc Bashoor and Fire Fighter/Medic Lieutenant James E. McClelland, Jr.